Fishing and photography are very similar in Vermont (really everywhere but more so there). When they are good, they are great but the greatness comes only in moments. The rest of the time you are just an idiot sitting by a body of water with a mortgage payment worth of equipment sitting idle by your side. As in life, you must revel in the beautiful few moments that make the rest of the unbearable dreariness bearable. This last week has been nuts. This is the first stretch of 3+ cloudy days in a row since probably last February! This spring summer has been very sunny and nice. It's pouring here again. BLAH Tomorrow supposed to be even worse. 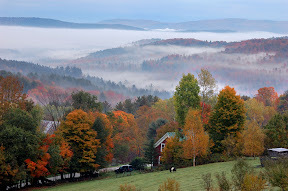 I always get discouraged if it's dreary during peak foliage, which has been often the past few years. BUT it really is true that you can get great foliage photos in overcast weather. And a little post-rain fog can really help too. It might not look great to the eye, but cameras do better with soft light than harsh sunlight. Some of my favorites were taken on days where I debated not even bothering with the camera. In fact I think I took these all on the same rainy day, probably the most productive photography day of my life. By all accounts this is a great foliage season. So get your rain jacket on, get back out there, and take some photos, dammit. Brian: Great to see you made it up this year. Good stuff as always. How are you? Hey Andy, unfortunately I won't make it up this year. Those shots are re-runs from 2009. I'm definitely kicking myself for not making it up this year. New job, moving to a new state (Maryland), and kids all conspired to keep me out of VT this year. I'm thinking about swinging over to West Virginia next week as I've heard that's a pretty good Vermont foliage substitute. I'm sure it's not the same though. Sorta like Aunt Jemima vs real maple syrup. Here's hoping we don't make things more dreary by talking about politics and/or throwing blame around re: the economy! Re: the weather.... it is dreary BUT there are a few, occasional spots of slightly brighter weather - we drove up the Killington access road and found a few moments of reasonable weather for photos. The color up there is also quite stunning!! BM said that there was some clearer weather at the top of the gap roads- no SUN, but definitely better than the drizzle stuff that has fallen all day. We couldn't escape it no matter where we were. Drove almost 2 hours one way to the NEK and the radar continually showed it clear and it POURED all day long. There was literally a 5 minute window it slowed to a mist and I got a few photos and then it poured the rest of the day. Tuesday was forecasted as 70 and sunny and we got rain wherever we went the whole day, then today was a 40% chance of light showers and it poured all day and tomorrow is a 90% chance. Maybe it will actually be 70 and sunny then? LOL! In all seriousness, I'm sure it's beautiful out here. Just really, really disappointed we planned for so many years and can only see what's right along the roads because the fog/rain is so thick. Ah, the weather kvetching thread. 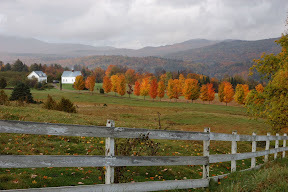 Let me join in... it was the best foliage season in years and the worst weather I have experienced in Vermont in years. Despite every weather forecast predicting "dry and sunny with occasional showers" it was overcast and rainy throughout from Sept. 30 to Oct. 7 ... and that weather pattern followed me from CT to the Adirondacks to the NEK. Friday, Oct. 5th was the only somewhat sunny day where I got some successful photos.... of course early morning sunrise was out of the question due to dense fog where you could'nt see your nose. I was on Newark pond on that dock at 7.30 am and could not see the end of the dock. Crystal lake and Lake Willoughby had amazing color and were shrouded in fog. I had a great time in VT as always, took hundreds of photos despite the lousy light (just have to post-process them over the months), went to some amazing locations (filed away now for next year), missed going to some fav locations, got lost on the back roads deliberately, found some great food including maple creemies, drove Rt. 100 on Columbus day weekend (took me 7 hours to get back to CT, the wife was not happy)... all in all, typical VT fall foliage trip.